With WESTGIRL cycle computer, you can manage your riding life more scientific and more reasonable. You need set the sensor on the front fork. For safe, please do not focus on the bicycle speedometer for a long time. If you do not riding, please take off the cycle speedometer, to protect it from the sunshine. Waterproof: The waterproof design makes it more convenient and durable. You can even use it normally on rainy days. Versatility: Small size, but light weight, can be used as a bicycle speedometer and odometer, measuring speed, distance and riding time, temperature, stop watch and so on. 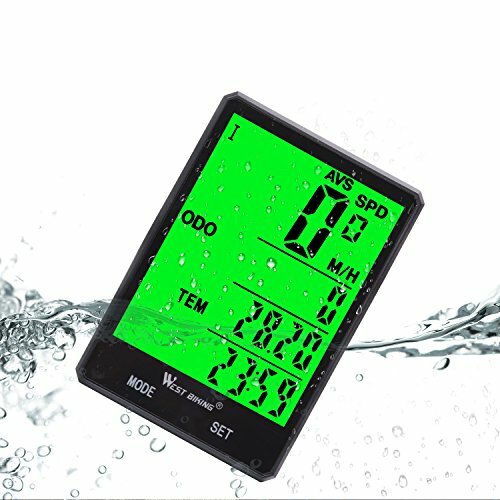 Large LCD Screen: Oversized LCD display, the data on the screen is displayed more clearly. Even riding at night does not affect the screen resolution. Backlight: During 17:00-07:00, screen will be lighted up for 4 seconds when you press any key. But if you want the screen always lighting any time, press both SET and MODE button for 1 second to keep the screen always lighting up. Press SET and MODE button for 1 second again to cancel it. Support language：English. Warranty&Support: Worry-free warranty, any problem, please feel free to contact us, we will provide friendly customer service with 24-hour quick response. If you have any questions about this product by WESTGIRL, contact us by completing and submitting the form below. If you are looking for a specif part number, please include it with your message.